Last Thursday, November 24, employees of the Israeli company “E.T. Legal Services”, hired by the deceptively named “Civil Administration” arm of Israel’s military Occupation regime in the West Bank, demolished a mosque. Among other things. To add insult to injury, Occupation forces arrested two young women for passive nonviolent resistance (see the video below). This is not your vanilla American “Occupy” arrest-and-release, get lawyer-and-defendant-rights arrest. The girls were entered into a sealed military vehicle and carted off to an unknown location (which eventually turned out to be an Israeli jail some 3 hours drive away), without any means – or rights – to defend their obvious innocence. 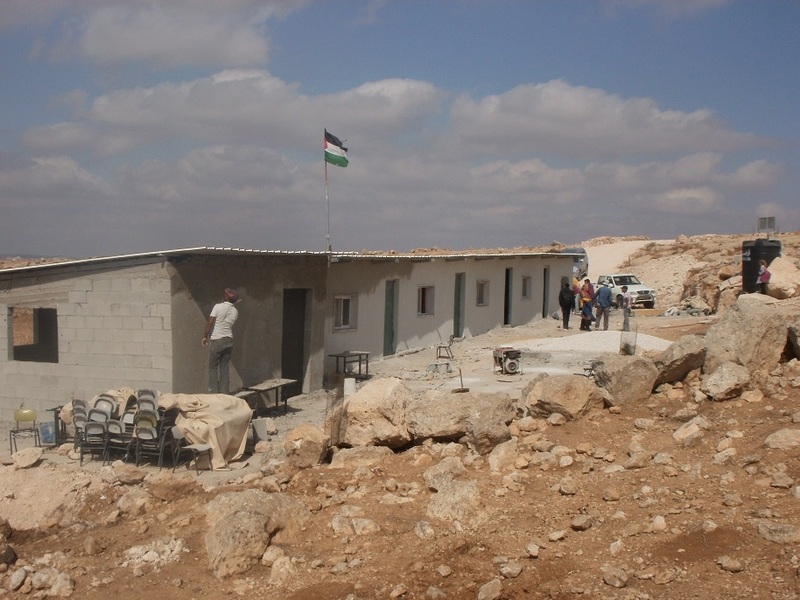 On that very auspicious day, the Occupation goons also handed out demolition orders to an impoverished village’s schoolhouse. Yes, that is the very same, one-year-old school whose pictures we brought to you in the last Villages Group blog post. Many people are unnerved, confused, even offended, hearing the terms “apartheid” or “ethnic cleansing” with regards to Israel, or even only with regards to the Occupation dictatorship Israel insists to continue running in its backyard. But I also know that ENOUGH IS ENOUGH. This is beyond disgusting. This is beyond apartheid and ethnic cleansing and squabbling over terminology. In its actions, especially in “Area C” that comprises 60% of the West Bank, Israel’s government is trying to murder the soul of a people and wipe it out as a nation – leaving only “human dust” that can be blown hither and thither and molded into whatever shape its rulers feel like. And you know what I, personally as an Israeli, find MOST insulting? Two things. 2. That all the while, two generations and counting, mainstream Israel pretends that this kind of stuff is not happening on a daily basis, brushes it off, explains it away, lies about it with a straight face – and continues to maintain the ridiculous charade of cultural and moral “superiority” over the Arabs in general and Palestinians in particular. If you are Jewish, and/or hold Israel dear, and/or don’t like reading this, WAKE UP. This is not about a specific politician, and certainly not about me or my choice of words. The actions described below are those of a fine-tuned machinery in operation for decades. It is ruthless, it is reckless, it is remorseless and it is soulless – and unless it is stopped, it will eventually leave nothing worth saving in Israel-Palestine, on all sides of whatever lines you choose to draw on that suffering land. So if you read this, you can say many things – but don’t say you haven’t been warned. Multiple times. We will try and engage larger organizations for action on these matters. Meanwhile, you can start protesting this outrage with an email to Israel’s defense minister, sar@mod.gov.il or pniot@mod.gov.il, fax +972 3 6976711 (they are said to hate faxes), or the ministry’s US outlet (info@goimod.com, fax 212-551-0264). Besides the demolitions that already took place, don’t forget to mention the school that was just served with a demolition order. The pretext for demolishing the school (“without permit”, of course – see above and below for the non-permit regime in Area C), is that it is claimed to be some 100 meters, maybe less, inside Area C, bordering on Area B. In Area B, the deceptively named “Civil Administration” has zero formal jurisdiction (don’t worry, then the Occupation’s other arms can come and carry out “security” demolitions if push comes to shove). In Area C, Israel is carrying out its newest social experiment and innovative contribution to the region in its role as “The Only Democracy”(TM): full control with zero accountability, with a generous helping of taxation-and-demolition without representation to the local Arabs. And of course, forget about building permits in Area C. Those are for Jews only. I end my personal rant, and here is the report from Ehud, followed by some more background information for those interested and/or those in deep-freeze denial, who for some indecipherable reason still bother themselves with reading this. Some of the events of the day have been filmed and uploaded to Youtube by Israeli activist Guy Batavia. Please watch it. There are more segments on his Youtube channel. The demolitions that the Israeli Occupation forces carried out in the the same day in South Hebron Hills (Thursday, 24.11.11) show that the duration of the bureaucracy leading up to the demolition itself changes from case to case: in the instance of Muhammad Mussa Mu’ghanem from Susya it was over within a few weeks. Without legal defense , no more than two months passed from the date the orders were issued to stop the works until Thursday, 24.11 when the bulldozer, escorted by army and police forces, arrived and demolished the two temporary structures that had served the Mughanem family in the past months. On the other hand, in the case of the cave-dweller hamlet of Umm Fakra (sometimes spelled “Umm Faghara”), the same bureaucratic process leading up to the demolition has lasted much longer: in spring 2000, the inhabitants returned to their hamlet from which they had been expelled in winter 1999. According to a High Court of Justice ruling enabling their return, they were prevented from any construction work until the final ruling in their case. The years went by and the final ruling was not given. The freeze preventing any possible development at Umm Fakra (including the forbidden connection to the power grid) became a permanent fact. About 4 years ago, the inhabitants of Umm Fakra began to breach this freezing order and dared build a small stone mosque for their own use. At the same time, the village elder, Mahmoud Hamamde, put up a structure with two dwelling rooms on top of his cave, for the use of his growing family. The following years saw some more structures built in Umm Fakra. The Occupation’s deceptively named “Civil Administration” has issued work cessation orders against all of these additions, shortly after their construction. The lawyers hired by the owners managed to delay the Occupation bureaucracy’s inevitable action for several years, until last Thursday (24.11.11): two bulldozers arrived at the hamlet, escorted by Occupation agents, soldiers and policemen, and completely demolished the village mosque and the living structure of the Hamamde family that served as a rabbit pen. Only one of the two rabbits at the time survived, the other died in the process. While demolishing at Umm Fakra, the Occupation forces arrested two young women of the hamlet – the mukhtar’s daughter, Sausan Hamamda, a 21-year old student, and her 17-year old relative, Amal Hamamda. The two were taken to Tel Mond prison inside Israel. From the little information we have at this point, apparently the Israeli police intends to accuse these two young women (whose professional and academic studies we have been supporting) of serious offenses, as might cause their relatively long incarceration. The senior commander from the [deceptively named] Civil Administration turned up to inspect us, together with thirteen bored, awkward soldiers. He’s the same guy I met at [Israeli outpost] Avigayil last month– easy-going, fluent in Arabic, all charm and good nature; the one who put an end to the Jibrin family’s plowing that day. He’s done it again this morning, when the Jibrin farmers attempted once more to plow near the ugly outpost. In fact, this pattern is now well established. They manage to plow for a few minutes, the settlers come out, then the army arrives, and the cheerful man from the [deceptively named] Civil Administration plays his inevitable role. The courts have confirmed that the land belongs to the Jibrin, but they only manage to plow it bit by bit, stolen moments before the machine stirs, an ungainly beast, and drives them away. …I suppose we should be grateful. You get used to the whole lunatic business. It even begins to seem normal, the normalcy of the Pax Israelica in the territories. That is: you become habituated to a world dominated by outright theft and all that derives from this single, organizing principle. …One can dither about whether the term “apartheid” is appropriate for the reality of the Occupation… But can Palestinians get on an Israeli bus passing their homes in the West Bank? Can Palestinian drivers use the roads built for settlers and settlers only? Can Palestinians get a permit to add a room to their house if it’s in Area C, or even to put up a tent or an outhouse? Can they graze their sheep on their own lands without being driven off at gunpoint by settlers or soldiers or both? Can they put down a gravel road that traverses their fields without the [deceptively named] Civil Administration stopping the work and impounding their tractors? Do they enjoy even the most minimal of civil liberties? Do they have legal recourse in the not uncommon event that they are suddenly stripped of their land, their possessions, and their freedom? Regarding Area C in general, earlier this year Amira Hass reported that in 2010, demolitions of Palestinian structures in this region had tripled. In area C, a building permit from the Israeli Civil Administration is required for all types of construction including rudimentary dwellings, pit-latrines and even fences. According to OCHA, Palestinian construction is effectively prohibited in 70% of area C, while in the remaining 30% there is a range of restrictions and administrative requisites that greatly reduce the possibility of obtaining a permit. Given the difficulties in obtaining construction permits, many Palestinians living in area C take the risk to build without a permit, therefore facing the threat of administrative demolition by the Israeli Authorities. There’s a wealth of information all over the Web – for example, a recent Btselem report about disposession in the predominantly-Area-C Jordan Valley. Keep in mind that Area C was conceived under Oslo as a temporary staging ground, to be rather quickly transfered to Palestinian control – pending final outline of borders on the ground (those famous elusive few-percent “land swaps”). As such, the jurisdiction of any Israeli body to tell any Palestinian what to build in Area C, where and how, is extremely questionable. Instead, when the process faltered, Israel started behaving as if the area was its own to keep. Except, well, the democracy, basic decency and rule-of-law parts of governing. Among other things. 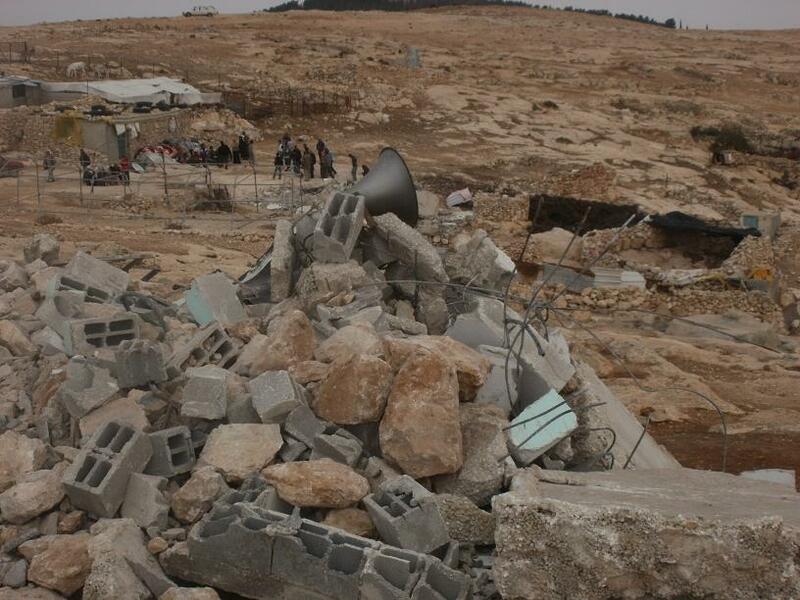 The thick irony is that the knee-jerk reaction in Israel to any story of such demolitions is “What do you want? The Law must be upheld!” This stupid response would have been funny, if the reality they help hide wasn’t so sad and revolting. Please help us stop this ugly, corrupt-to-the-core madness. Thank you. 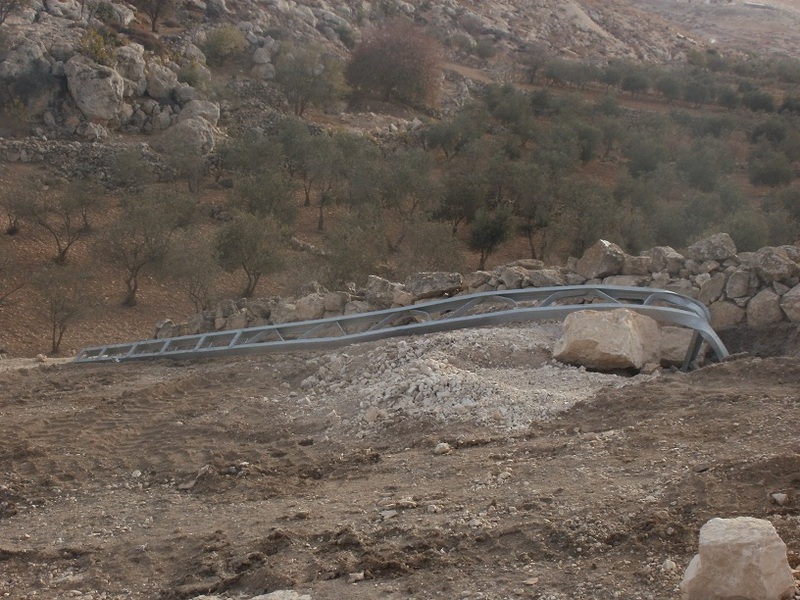 here (destruction of line connecting village to Palestinian power grid, see pic). These reports come only from a tiny sparsely-inhabited piece of land. There are many, many more such “cultural activities” carried by the Israel government, showering freedom, democracy and progress on the Palestinian residents under its total control, all across Area C.
Maine, here in the USA, is a terrorist state. That is, the economy of Maine depends on terrorism. If we didn’t have terrorists in Maine, there would hardly be a Maine. The terrorists like the “rockbound coasts”, the “tall firs” (trees in the book title by Sarah Orne Jewitt), the quaint local accent, but mostly the terrorists just like terrorism. I don’t know what they do what they’re not being terrorists. They must have a life of some kind other than terrorism. But all we see of them is their terrorism. But, like I say, the whole state is based on terrorism. One thing about terrorists: they have a terrible sense of humor. One might even say it’s terrorizing. Terrific. I would say you’ve reached reality in this blog poast. Now, as they’d say in old South Africa, you have to learn to carry it without being destroyed by your own anger. At least that’s what a liberal Afrikaner told me. Now I’ve thought about this and that for ten minutes, here’s a serious response. We hear of honor killings over illicit marriages, etc. Suicide can be a matter of honor, like the captain of the Graf Spee wrapping himself in the Kriegsmarine flag and shooting himself when the British bottled him and his (Nazi) ship up in Montivideo harbor. As the crew scuttled the ship. Israel is like that. I have elements of my life that are like that. If this cause be wrong, then damn me to hell, but it is my cause. That sort of thing. What can you do for someone in this state? Pun? Mostly you have to let them find a better way to respect themselves. Probably the only thing you can do there is not flinch from showing them when their sense of honor victimizes others. but toxic honor (to coin a phrase) is where you can’t talk about it at all, but just have to carry out its mandates.